Dr. Olsen offers quality, name brand hearing aids (Siemens, Phonak, ReSound, Unitron, and Oticon) at reasonable prices. 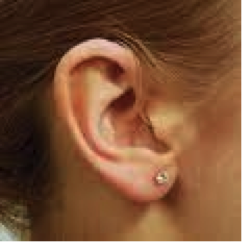 Because Dr. Olsen owns the practice and is independent, she can recommend a particular hearing aid model based on your specific hearing loss and communication needs (unlike many retailers who carry only one brand). You are always given a money-back trial period of 30 days, so you have ample opportunity to try out the hearing aids in a variety of listening environments. Follow-up services, including sound quality adjustments, are included for as long as you own the hearing aids to ensure that you are receiving the maximum benefit from your hearing aids. You can come in as often as you feel is necessary, at no additional charge. Many of the newer hearing aids are practically invisible, yet include advanced features such as directional microphones and multiple programs, which help you hear better in a variety of situations, including noise. With a directional microphone system, their are two microphones on each hearing aid which work together to give preference to sounds in front of the wearer and reduces sound, especially noise, from behind the wearer. This technology has been proven in research to improve speech understanding in background noise. In some more sophisticated models, the focus point for speech can be configured to be to the right, left or behind the person. This enhances listening benefit in difficult situations, such as the car. Many of these hearing aids also have an easy-to-use pushbutton for changing volume or programs on the hearing aids, if desired. For instance, if you want an enhanced listening program for watching TV or listening to music, you simply push a button on one of the hearing aids to switch to that program. Some of the hearing aid models have a rechargeable battery system, which eliminates the hassle and inconvenience of changing batteries. Many new hearing models can also be paired with your smartphone, allowing you to use an app on your phone to make sound adjustments to your hearing aids. Additionally, many models allow Bluetooth interface with an accessory that establishes a wireless connection between hearing aids and Bluetooth compatible devices such as cell phones, computers, televisions, and remote microphones.